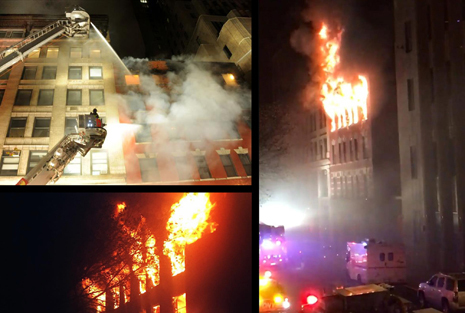 On Monday October 19, 2015, at about 3 a.m., 250 New York City firefighters were called to battle a five-alarm fire at 221 West 17th Street in Manhattan – a vacant building under construction adjacent to BTA’s headquarters. The fire raged for four hours, engulfing the building’s fourth, fifth and sixth floors before being extinguished just before 7 a.m.
For safety concerns, the building housing Bernard Tschumi’s office and loft was evacuated for over 24 hours. Tschumi’s archive of original drawings and prints, assembled for the architect’s retrospective at the Centre Pompidou in 2014 and recently returned from a subsequent exhibition at the Swiss Architecture Museum in Basel, had been stored less than eight feet from the inferno! We are happy to report that the office and drawings were undamaged by the fire and that no one was injured in the blaze.